Most people who fly into Tokyo land at Narita and promptly get a train to Tokyo; passing up a stay in one of the oldest cities in Japan. Although the name Narita does not appear in written records until 1408, stone tools dating from 30,000 years ago have been found on the site of Narita airport. So for our three perfect days we will investigate Narita.We are staying at the Holiday Inn which is a short drive from the airport in their little shuttle bus. Breakfast is served in the restaurant, and although there is a small selection of western dishes (fruit, scrambled egg, tomatoes and toast), it mainly caters for the Asian market with plenty of rice, vegetables, miso soup and congee. After breakfast we plan to visit Narita-san Shinsho Temple via the circular bus. The Temple is quiet and at the entrance there is a raised fire pit where people congregate and wave their hands in the smoke. 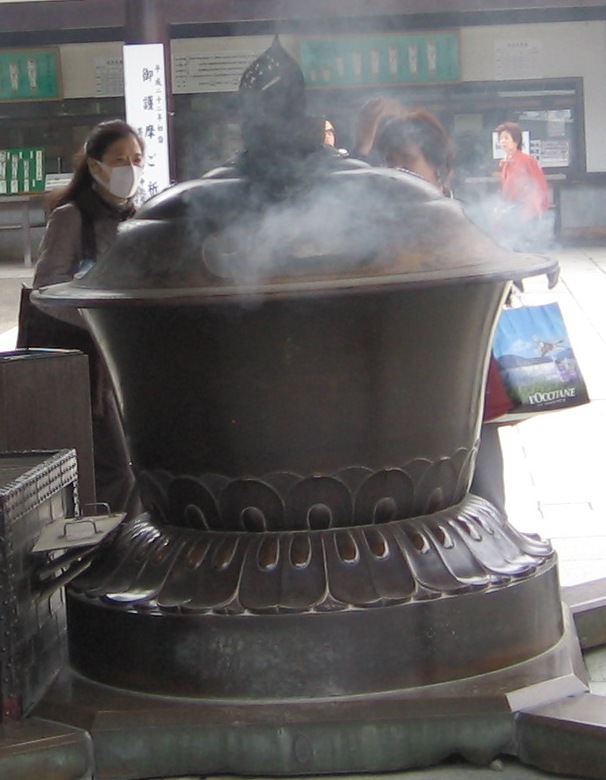 We learn later that the Temple is a shrine to Fudomyoo (a fire god) and the fire is a symbol of his wisdom; the waving of hands in the smoke is said to extinguish earthly passions and bring us to a higher state of mind. The Temple is built of simple grey stone and there are lots of separate halls and smaller buildings and shrines, and one enormous 58 metre high Pagoda. There is a large courtyard where people sit and chat, and a young mother and child dressed in traditional dress are constantly photographed by tourists—including us. 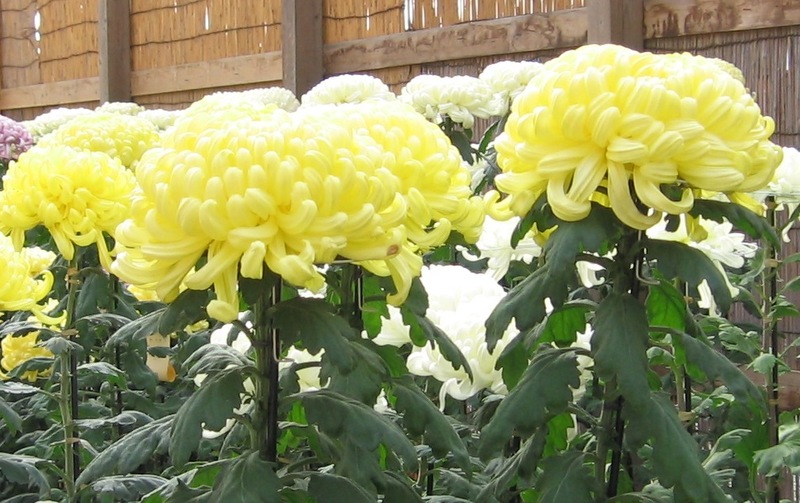 Leaving the Temple we find ourselves in a chrysanthemum garden—the blooms are the largest we’ve ever seen and the colours are amazing with the common white and yellow sitting next to rows of pink, lilac, orange and red. It’s all very orderly with separate greenhouses for each colour. We leave the garden and walk slowly down the main cobbled street. There are cafés and restaurants, gifts and souvenirs, jewellery and accessories, and market stalls selling trinkets, chopsticks, and the ubiquitous gold and silver waving cats. Will we get one? Why not—he may bring us luck. Back on the bus we hop off at a shopping centre and check out the supermarket. Dinner is sushi, shredded beef and noodles, and a couple of Kirin beers. At the hotel, over another Kirin, we pore over the train timetable and finally surrender to a day trip to Tokyo the next day.The rail transport in Tokyo is awesome. It’s never late, it’s clean and although we have all seen and heard of the train pushers at commuter time; when we are travelling it’s remarkably quiet. The train takes us to the main station in Tokyo where there is an underground shopping centre. You can get lost in here. You name it, you can buy it. There is also a large Daimaru department store which has one level entirely devoted to cakes. We are so amazed by the size and presentation of these sweet gastronomic delights that we simply stand and stare. There are elaborately decorated sponge cakes, gateaux, giant éclair cakes, birthday cakes, wedding cakes, cream cakes, yellow cakes, green cakes, pink and blue baby cakes, animal cakes, and cakes made to look like the Eiffel Tower, the leaning tower of Pisa, and … oh my, look there, it’s the Sydney Opera House! We tear ourselves away from this sweet feast to find a café for lunch. It’s pouring down when we leave the station and hurriedly buy our tickets to Keisei Narita. The train trundles along—it seems to be taking longer than it did to get there and it’s packed with school children. You get up and look at the map, and then … “Er, this train isn’t going to Narita.” What! Where is it going! “Chiba something.” Faaarrrkkkkk!!!! Off the train at the next station; we cross over the bridge and seconds later another train takes us back to where we started. This time we’re on the right train, and we thank Japanese rail for its efficiency—even though we arrive back at Keisei Narita, in the rain and dark, an good hour later than planned and have to wait 30 minutes for the little circular bus to the hotel. The next day is shopping day and we take the bus to the Aeon Mall. This is a huge shopping centre and we spend an extraordinary amount of time trying on clothes and shoes. A couple of jumpers and three pairs of shoes later we stumble across the Hello Kitty shop. 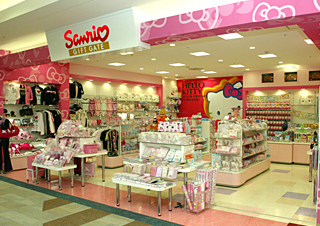 This shop is as big as small department store in itself, and any Hello Kitty item you could imagine is here; from suitcases to pencils and everything in between including t-shirts; pyjamas; baby clothes and accessories; beanies and gloves; slippers and gumboots; glasses (both for wearing and drinking out of); crockery, cutlery and bakeware—yes, you can buy moulds for Hello Kitty cupcakes—jewellery, shopping bags, and every item of stationery, all emblazoned with that cute little kitty face. We climb aboard the circular bus holding our Hello Kitty shopping bags aloft and smile childishly at everyone on the bus. They just look and nod. But who cares? We’ve had a great time, and as it’s our last night we will splurge at dinner in the hotel restaurant. This entry was posted in All posts on July 20, 2012 by gracienumber1.